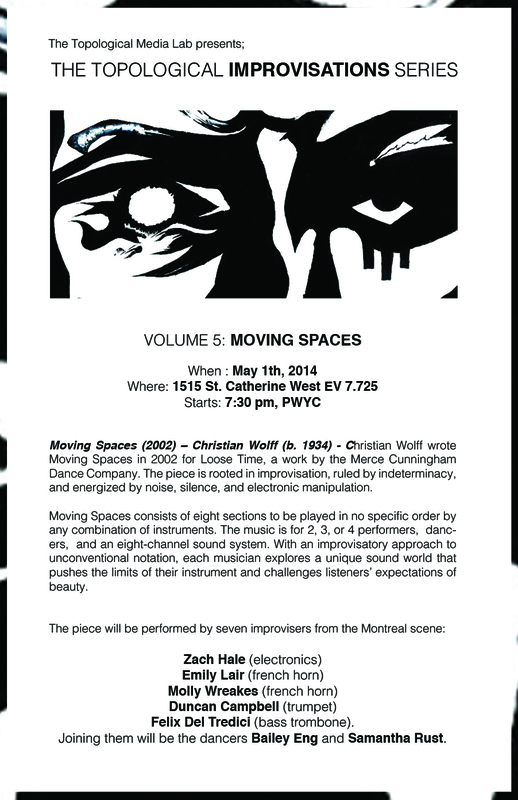 Moving Spaces (2002) – Christian Wolff (b. 1934) – Christian Wolff wrote Moving Spaces in 2002 for Loose Time, a work by the Merce Cunningham Dance Company. The piece is rooted in improvisation, ruled by indeterminacy, and energized by noise, silence, and electronic manipulation. Moving Spaces consists of eight sections to be played in no specific order by any combination of instruments. The music is for 2, 3, or 4 performers, dancers, and an eight-channel sound system. With an improvisatory approach to unconventional notation, each musician explores a unique sound world that pushes the limits of their instrument and challenges listeners’ expectations of beauty. The piece will be performed by seven improvisers from the Montreal scene: Zach Hale (electronics), Emily Lair (french horn), Molly Wreakes (french horn), Duncan Campbell (trumpet), Felix Del Tredici (bass trombone). Joining them will be the dancers Bailey Eng and Samantha Rust. A native of Edmonton, Molly Wreakes began her horn studies with Allene Hackleman. She is currently completing her Bachelor of Music in Horn Performance at the Schulich School of Music of McGill University where she studies under the tutelage of Jean Gaudreault. In 2012, Molly was chosen to represent Alberta at the Canadian Music Festival where she placed second in the Brass division. She has performed with the Edmonton Symphony Orchestra, Opera Nuova, the McGill Symphony Orchestra as well as other various groups. Aside from having a keen interest in orchestral and solo repertoire, Molly seeks to expand her horizons through improvisation and contemporary music. Duncan Campbell, by time of your reading, will have finished his undergrad in Trumpet Performance at McGill. He is engaged in projects such as Little Suns (please visit www.littlesuns.ca for more information), solo contemporary repertoire and a recently formed baroque ensemble known as I Fiori dell’amore. His musical interests include early Russian liturgical polyphony, Balkan brass music, Karlheinz Stockhausen, German romantic songs for female voices, electronic dance music, north Indian classical music and punk rock. He aspires to write music for diverse instrumentations and with diverse approaches to genre. Originally from Gimli, Manitoba, Emily Lair is a horn player based in Montreal, Quebec, studying at the Schulich School of Music of McGill University in the studio of John Zirbel. In addition to her studies in orchestral performance, Emily is an avid chamber musician and soloist who seeks to expand the role of the horn in contemporary and pop music. Emily is a three-time member of the National Youth Orchestra of Canada. She has performed in the Winnipeg Symphony Orchestra’s New Music Festival, the Manitoba Underground Opera Company, and in masterclasses with James Sommerville, Julie Landsman, and Andrew Bain. She is a recipient of the Wirth Brass Scholarship at McGill University, as well as other awards from the Manitoba Arts Council and several organizations in Manitoba. After graduating from McGill University in Spring 2014, she plans to continue her studies at the Colburn School in Los Angeles, California. A native of Montreal, Felix Del Tredici strives to push the boundaries of the bass trombone through interdisciplinary collaborations, the commissioning of new works, and improvisation. The New York Times has described Del Tredici as an “extraordinarily versatile trombonist” who gives performances that are “disturbing yet fascinating” and “hair-raisingly virtuosic”. He has studied at the Darmstädter Ferienkurse für Neue Musik, and is a member of the Fonema Consort, the New York Trombone Consort, and Ensemble Moto Perpetuo. Zachary Hale is a Montreal-based composer and percussionist who creates and performs music that deals with live-electronics and new interfaces. His interest lies in the possibilities when the performer and technician are one in the same, and also bridging the gap between classical musicians and technology. Recent highlight performances with live-electronics include Reflecting Space III by Kenji Sakai (North American premiere), Caprices 5-6 by Luis Naón(North American premiere), and Konakte by Karlheinz Stockhausen. His current projects include the SpectraSurface interface and N[i]Quest with oboist Krisjana Thorsteinson. More information can be found at www.zachhalemusic.com. Inspired to challenge the physical capacity of the human body, Bailey is searching to develop a style of body movement influenced by circus and acrobatics – with and through contemporary dance. She is fascinated by objects as an extension of the body; objects, like the body, also as living and breathing structures. Whether it be a circus apparatus, a physical space, or the urban environment, she challenges the function of structures and explores (path)ways of negotiating movement with architecture. The ability to move is not limited to the learned habits of performing a task. Bailey is interested in transforming the spectacular into the accustomed. How can the body and movement be absurd and disorienting, yet habitual, natural, and human? She resists the quotidian, but seeks its essence. She str e e e tches interpretation. She thrives off of the (un)restrictions of gravity. Driven by (un)limited (im)possibilities, there is no upRight or upWrong. Movement is her way of life, Body Language is what she speaks – carried by the ideal of “translation not required”. Samantha has been dancing since she was three years old, and has studied many different dance forms such as musical theatre, tap, ballet, jazz, contemporary, and hip hop. She has attended different workshops which include: The Pulse, Broadway Dance Theater, Dance Movement Therapy Association in Canada and many others. She received a D.E.C in Dance at Cégep St-Laurent in 2012 and she is currently teaching her eighth semester of hip-hop to elementary students at Hill Crest Academy. Her work aids in social and motor skill development, benefiting those involved, and a part of the Mentally Handicap community of Montreal. Dance is her outlet, and the best way she feels she can express herself. As an artist, Samantha would like to show how art could be used to join a community, and help develop different skills in children and adolescents. Through movement, art and music, people with disabilities can be motivated and triggered in different ways to help with every day movement and relations. Simple exercises that require them to use speech and physical movement inspired by music and visual art help in their everyday communication facilitating their interactions with others. Creating different approaches to life through Contemporary art allow for people with disabilities a chance to learn life lessons in different ways and live freely amongst others. Samantha strives to encourage open mindedness and creativity in each individual.